There are several ways to get from Amsterdam to Almere. Rental car rates are much cheaper in Almere than in Amsterdam. For Amsterdam car rentals try Sixt, Hertz, Avis. In Almere use Sixt or Autorandaam. 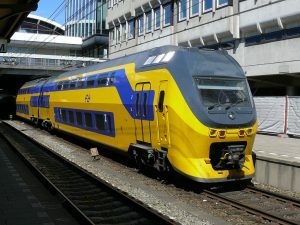 Sprinter and Intercity trains cost the same, but intercity trains are faster and stop less. If you need to stop in a suburb of Amsterdam or Almere use a Sprinter train. If going center to center, use an Intercity train. Buses take almost 3x as long for a savings of 1 euro. Do yourself a favor, buy the Amsterdam Almere Region Travel Pass and take the train. It is cheaper and faster.